In Supply Chain Network Optimization and Competitive Advantage – Part 1, I began exploring the notion articulated by SC Digest’s editor Dan Gilmore in a recent post about Supply Chain Network Optimization and Competitive Advantage. In the article Mr. Gilmore goes on to describe how a few companies are adopting this particular aspect of Supply Chain Management in their processes so much so that it is seen as a source of competitive advantage. A company’s best and most innovative users of information technology, business models, financial engineering and almost everything else that applies to operations suffer from the same availability to rivals. What a firm can do, its competitors can eventually do as well. IT effectiveness, HR policies, financial strategies, and so on are essentially aspects of what it means to operate efficiently. So where does the above discussion leave the supply chain planning and network optimization function? Before I get into the discussion of where the competency of supply chain network modeling and optimization lies, I need to explain what it is, what is within its general scope and how it is used. 3. What is the product portfolio that should be located at each of the nodes (nodes are elaborated above)? 4. What is the appropriate inventory levels that should be maintained at the nodes? 5. Is the Days of Service to my customers acceptable to them? 6. Given growth projections from the firm’s sales and/or marketing team, is my supply chain network able to handle the load – increased or decreased throughput? 7. What is the echelon structure that I should use for my supply chain network? 8. What is the total cost of operation and further the specific transportation, manufacturing and warehousing costs involved? If I were to create a general view of supply chain decision making largely according to the timeframes involved, the figure below would be a succint representation of that view. One would expect to find that supply chain network modeling and optimization would fall in the Strategic planning layer and/or the Tactical planning layer. 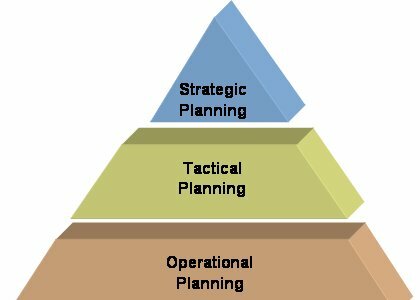 Since the operational layer will contain not only execution support systems but also a repository (by repository I mean a data warehouse wherein all activities are recorded and tracked) of all activities taking place on an operational basis, this data represents the translation of a strategic/tactical plan into action – in other words execution. In order to make this a closed loop system, this operational data needs to be fed back into the strategic/tactical planning layer on a continual basis thus enabling the refinement and adjustment of strategic and/or tactical plans as needed. In the next post, I will explore a graphical view of what kind of problems supply chain network modeling can address and then further explore whether such problem solving can really be called a competitive advantage, a model of efficient operations or something else. The intuition on my part is that such problem solving, execution and the feedback loop described above is something other than a competitive advantage and a model of purely efficient operations. It is actually something in between – something that I would call a relative operational advantage.